Sterling Children's Books, 9781454929673, 32pp. Axolotl, sea pig, mirror spider. These are some crazy-looking critters But no matter how bizarre or wacky, there's a reason why animals look the way they do. These characteristics--including their colors, teeth, and behavior--help them survive. 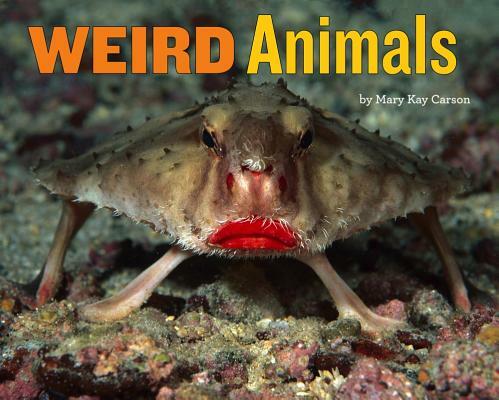 With the help of some amazing photos, Mary Kay Carson reveals that, no matter how odd, things like slime and freaky noses are more than just surface features--they're lifesaving. Mary Kay Carson has written more than 50 nonfiction books for kids, including several titles in Houghton Mifflin Harcourt's award-winning Scientists in the Field series, such as The Park Scientists and The Bat Scientists, an ALA's 2011 Notable Children's Books for Middle Readers. Her book Exploring the Solar System received the 2009 American Institute of Aeronautics and Astronautics Children's Literature Award, and the State Library of Ohio selected Beyond the Solar System as a "Choose to Read Ohio" book for 2015 and 2016. She lives in Cincinnati, OH. Learn more about her at marykaycarson.com and follow her @marykaycarson.